Tens of thousands of protesters from across the United States are expected to fill the streets of Midtown Manhattan on September 21. They will demand that world leaders take action on climate change at a U.N. summit to be held in the city two days later. More than getting large numbers of people into the streets, organizers of the People’s Climate March are turning to artists to drive home their message that pursuing business-as-usual policies while the planet burns is no longer acceptable. The climate march will include hundreds of children carrying their own hand-made signs and banners, scientists in white lab coats, building trades workers with images of green buildings, Hurricane Sandy survivors holding aloft waves made of papier mâché, a bike bloc, a boat bloc, roving musicians, a climate march chorus, a “people’s treaty” mass public ritual at the end of the protest and much more. “This is the place where we can show all the different ways climate change affects human life,” said Rachel Schragis, a visual artist and organizer with the environmental group 350.org. Much of the arts production for the climate march and other spin-off protests around the U.N. summit will take place out of the second floor of the newly opened Mayday community center in Bushwick, seven subway stops into Brooklyn and far removed from the wealth and power of Midtown. The space will also host working group meetings and possibly an online media center that would cover the climate mobilization. On the first Sunday in August, the 4,000- square-foot Mayday arts space was already bustling with energy as People’s Climate Arts Team staffers and volunteers moved in donated furniture and supplies and painted colorful signs to be posted around the space. The expectation that hundreds more people will be pouring into the space in several weeks’ time was palpable. “To see a space like this pop up feels right to me,” said Raquel de Anda, an arts team project coordinator and former curator of a radical Latino art gallery in San Francisco. The People’s Climate March has been endorsed by more than 700 groups from across the country, including a number of New York City labor unions, faith-based groups and community organizations. The two biggest players behind the protest are 350.org and Avaaz, a global, online civic organization co-founded by Moveon.org. Planning for the climate march began early this year. Activists with past ties to the Occupy movement urged the protest’s leaders to put arts at the center of the event and to not make a large turnout the sole metric of success. “For popular social movements to succeed, art and creative work must be at the core of their visions,” said Gan Golan, another arts team project coordinator. Putting art at the center of a movement, explains Golan, allows it to speak in a bold, unapologetic voice and to offer a galvanizing vision of not only what people are fighting against, but what they are fighting for. Golan is on leave from his position as national training director for Beautiful Trouble, a network of artist-activists that trains grassroots movements in how to be more creative and impactful. In Golan’s recounting of U.S. social movement history over the past 40 years, the unraveling of the New Left and the counter-culture at the end of the 1960s prompted a shift toward more button-downed, professionalized forms of activism. This turn saw the rise of non-profits with corporate structures that focused on winning incremental victories. The cautious speech of well-educated professionals like lawyers and academics became ascendant while the utopian voice of the artist was cast aside. That is beginning to change, says Golan, especially since Occupy’s success in bringing a vision of broad-based resistance to corporate rule into mainstream society, something others on the Left had failed to do for decades. Occupy also helped to popularize a networked approach to organizing that creates real or virtual spaces from which people can self-organize their own actions. This approach, which Golan refers to as Organizing 3.0, is gaining more acceptance, he says, from people doing Organizing 1.0 (traditional Saul Alinsky-style community organizing) and Organizing 2.0 (Internet-based activism that relies on large numbers of people responding to appeals to carry out small tasks to achieve a larger goal). “Each of these models is very good at very specific things,” Golan says. “Our goal is not to replace other models, but we can be the missing ingredient. People’s Climate March leaders have committed substantial resources to the arts space, including funding for five full-time staff positions. In time, the march may be seen as a breakthrough in how activists from different organizing traditions can mesh their strengths to create a more powerful protest than any could do on their own. “We have the perfect marriage of the grassroots and the funding of the 501c3,” said Oja Vincent, director of operations for the arts space. Can capitalism solve the climate crisis it created? Or will addressing climate change require system change, i.e., a radical break with a socioeconomic model that values profits above people and the planet? Organizers with the NYC Climate Convergence believe the latter. They are hosting a Sept. 19-21 gathering that will feature movement-building workshops, skill shares and a roster of speakers that includes food sovereignty champion Vandana Shiva, Bolivian labor leader and water rights activist Oscar Olivera and 2012 Green Party presidential candidate Jill Stein. The NYC Climate Convergence will host a fundraiser for the event Aug. 29 at the rooftop garden of the Brooklyn Commons at 388 Atlantic Avenue. For more information, see convergeforclimate.org. Climate march organizers have worked to make sure that the march and the arts space reflect the diversity of the city. Grants have been made to a number of groups, including Rockaway Wildfire, Right to the City Alliance, the Sunset Park-based UPROSE and the Immigrant Workers Art Collective. Each of these groups will be producing their own art for the march with help from the trained artists as needed. For de Anda, the work going into the march will help to build relationships among a citywide network of groups that can be activated again in the future. 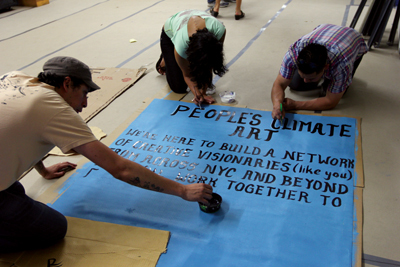 Bringing the People’s Climate March art space to Bushwick has also been a boon for Mayday. 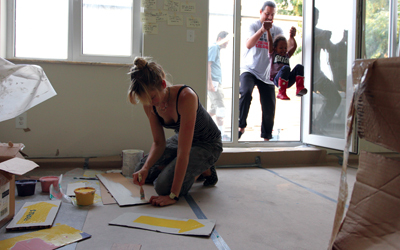 “This is our wildest dream come true,” said Ana Nogueira, one of Mayday’s co-founders. “It’s a great start to the space. Nogueira, a journalist and documentary filmmaker who co-founded The Indypendent in 2000, and Mcnair Scott, her business partner, hope to launch a bar and performance space on the first floor by the end of the year. The revenues from that would be used to subsidize an ongoing non-profit social movement space on the second floor. “Our movements need infrastructure,” Nogueira said. “Being in a movement building having face-to-face conversations with people makes our work more fun and effective. For now, the focus at Mayday is on filling New York’s streets next month with politically charged art. Climate change has languished as a political issue while the planet has heated up at an alarming rate. For the People’s Climate March to have an impact, organizers know that it will take a whole lot of feet in the streets as well as visionary messaging that conveys why they are there.